By Susan E. Mazer, Ph.D. Published by Planetree, February 2015. Although we try to reduce the patient experience to a set of HCAHPS questions and satisfaction survey scores, it is not merely a set of perceptions, but rather, is a gestalt, the totality of many events that merge into a single experience. The patient experience is lived a moment, an event, an injection, an examination at a time. Because of how our minds work, the long journey of each day becomes blurred and patients remember only what stands out to them. They may not remember each minute of every hour of their hospitalization. They will recall extraordinary acts of kindness and consideration. However, they will also remember the agony of waiting for the next pain medication, not being able to sleep, and hearing the nurses or others laughing just beyond their door. They will also remember if their room became their personal prison, untidy and unchanging. For this reason, we should not minimize the important role that patients’ environmental interactions play in creating and influencing the patient experience—particularly when it comes to the auditory environment. 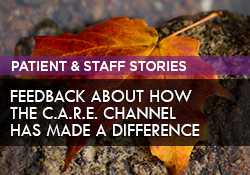 Roundtable Series: Supporting Compassionate Care with C.A.R.E. 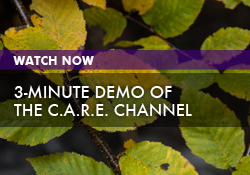 Webinar Series: Pain Management and C.A.R.E.